New supported release 8.1.0 "Andean Parakeet"
On behalf of the Parrot team, I'm proud to announce Parrot 8.1.0, also known as "Andean Parakeet". Parrot is a virtual machine aimed at running all dynamic languages. New release 7.11.0 "Amazonian parrotlet"
On behalf of the Parrot team, I'm proud to announce Parrot 7.11.0, also known as "Amazonian parrotlet". Parrot is a virtual machine aimed at running all dynamic languages. + Improve darwin and cygwin build, seperate installable libparrot. Parrot 7.10.0 "Wyrd Parrot" released! And the band struck up. who hobbled out into the glare of the torches. OLD MAN (an Elder): "What hath befell the land?" OLD WOMAN (a Crone): " 'Tis a terror—"
He uttered the stage manager's traditional scream of rage. witches – where are the blasted witches?" Three junior apprentices presented themselves. "The cauldron's all full of yuk!" "There's something living in this wig!" "This is the night, Hwel!" On behalf of the Parrot team, I'm proud to announce Parrot 7.10.0, also known as "Wyrd Parrot". Parrot is a virtual machine aimed at running all dynamic languages. New supported release 7.9.0 "Sangihe hanging parrot"
"The Sangihe hanging parrot (Loriculus catamene) is a small (length: 12-13.5 cm) parrot endemic to the small island of Sangihe, north of Sulawesi, Indonesia. This is an arboreal parrot. It is predominantly green, with a red throat patch, rump, elongated uppertail-coverts and tip of tail. 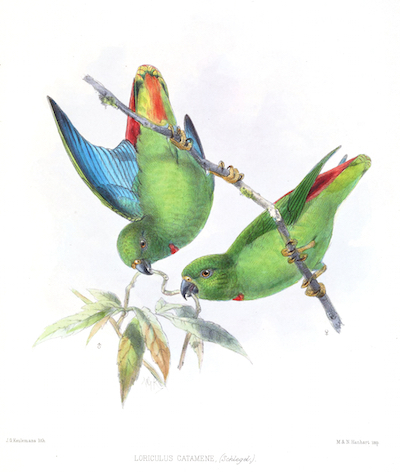 In 2009 this parrot was downlisted from Endangered to Near Threatened because although it has a very small range within which there has been extensive forest loss and fragmentation, it apparently remains common in degraded and cultivated habitats and there is no evidence of a continuing decline. The current population is estimated at between 10000 and 46000 individuals." On behalf of the Parrot team, I'm proud to announce Parrot 7.9.0, also known as "Sangihe hanging parrot". Parrot is a virtual machine aimed at running all dynamic languages. + StringBuilder.clone and ResizablePMCArray write barrier optimizations. collectors ms and ms2, which are ~20% faster. I am extremely happy to announce that I have successfully completed my GSoC project! I would like to take this opportunity to thank the community for this wonderful learning experience. It has really helped me to add a new dimension to my knowledge while at the same time introducing me to the world of open-source projects. Most importantly, I would like to thank my mentor Reini Urban (rurban) for the tremendous help he offered me, ever since my first contact with the community. As a matter of fact, without his ideas and invaluable guidance, completing the project would have been an impossible task. I would also like to thank my co-mentor Bruce Gray (Util) for guiding us throughout the project and providing us with valuable inputs to overcome the many hurdles we faced. In this blog, I will attempt to summarize the work I have completed through my project. This week I ran the bench test on the three tasks to verify the performance gain. But due to my slow machine, I could only generate varied and unreliable data. However, rurban confirms that all the tests are passing and the branch pcc-gh1083 is ready to be merged for the Parrot release scheduled on 19 August. Also, he soon plans to test it with a 32 bit machine as well. I will be sharing what I have completed this week. Last week, I had mentioned that I would be fixing further problems in my branch to optimize pmc2c (https://www.parrot.org/zyroz10). I am happy to share that I have successfully completed this work and believe that the issue GH #1083 (https://github.com/parrot/parrot/issues/1083) is now resolved. To elaborate on the work done --- a couple of weeks back, I started by omitting the obj check in the CallContext ATTR accessors in include/pmc/pmc_callcontext.h. This week I completed the part of my task that required me to export the internally needed CallContext vtable methods (https://github.com/parrot/parrot/issues/1083). These exported methods are now included in src/call/*.c to improve the performance, since these methods are now being directly called. In the previous week, I had finished fixing the headers to omit the obj check for CallContext ATTR accessors. But I had made these changes manually by fixing include/pmc/pmc_callcontext.h. Through this post, I will be sharing my progress towards the task - https://github.com/parrot/parrot/issues/1083. I have completed the part of the task that required me to inline the CallContext ATTR accessors to omit the obj check. For now, I have manually edited include/pmc/pmc_callcontext.h to fix the macro definitions. However, after completing the remaining task and ascertaining an improvement in speed performance, I plan to improve pmc2c to automatically generate this fix. Let me share this week's progress. Earlier this week, I finished my tests with Parrot for its releases 2.7 - 3.0. Including rurban's profiling, we now have data (reliable to some extent) for the commits in this range. The main objective for the profiling was to determine the highest overhead to be targeted next for refactor.